Dave Trudeau was in the construction business when he took notice of the need in the industry for superior building products. He discovered a Canadian product that laminates windows to make them smash, burglar, bomb, explosion, and hurricane resistant while also providing measurable energy efficiency. 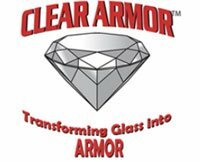 Dave saw the potential in such a product and formed his company, Clear Armor LLC, to market and install the product. Dave started Clear Armor in August of 2011 with help from his SCORE mentors. Phil Hartung, Norm Letofsky, and Tom Garrison met with Dave on a regular basis to tackle issues concerning sales, marketing, obtaining working capital, operations, and overall management of the company. Clear Armor clients include homeowners, companies, and organizations that require a high level of security against unwanted intrusion or unexpected weather events. In the first year of business Dave and Clear Armor have seen rapid growth with clients ranging from large corporations to multiple government agencies. Clear Armor continues to expand their customer base and has had to bring in enough employees to form three installation teams of 2-4 employees each. They have outstanding proposals that will require them to add additional installation teams in the coming year. After his first year in business, Dave found that Clear Armor had already turned a profit. Dave has high praise for his mentors. He says, "I am very appreciative of the encouragement and support that I received from my SCORE mentors. In our first year of business, we kept coming up with new challenges and difficulties. Even so, each time we met, my mentors told me how well we were doing. Whenever I brought up a problem I was having, my mentors kept working with me until we came up with a solution".